On March 6, the Business Technology Management (BTM) program hosted a networking reception for the BTM Advisory Council and BTM students. 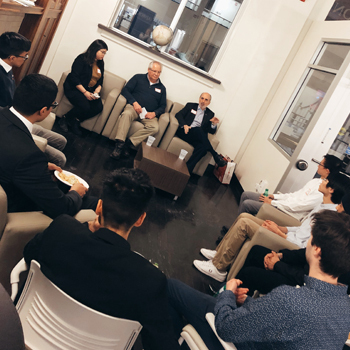 The evening was structured to provide students with the opportunity to network with professionals in the field, and to gain important insights into the hiring process – especially as it applies to co-op positions and upcoming co-op interviews. The evening began with some light refreshments before students were divided into groups to participate in discussions with members of the council. A common theme that was shared amongst the council members was the ability of BTM grads to span the divide between business skills and tech acumen in a way that enables them to work within cross-functional teams, speak to both sides of what can sometimes be functional divisions, and help businesses move processes forward more quickly, with greater understanding. “Traditionally in tech, the best coder found themselves in charge of all the coders, but they didn’t know much about managing people. That’s where this program is so unique – BTM produces well-rounded grads who make the connection between people and tech.” Scott, a member of BTM council told the students. Speaking with students in the program, it was clear that this is a tight-knit group who really get to know their peers and work together for the success of the team. “I know and have worked with every person in my cohort, so it’s a really great feeling,” 4th year volunteer Jake told me. Sherry, a member of the BTM Council, and BTM ’16 grad, originally moved from Shanghai to Brantford to pursue her degree. The small program and community feel helped her adjust in a new country, and the support at Laurier helped her land her dream job in Toronto after graduation. “It’s really special to see the members of the BTM Advisory Council interacting with our students – supporting their success and answering their questions. I think it shows our students how dedicated the council is to their long-term success, and it reinforces to council how promising the future is for these students,” shares Trish McLaren, Associate Professor and Program Director, BTM. A unique attribute of the BTM program is the automatic enrolment in co-op, giving all BTM students the opportunity to experience different career options before graduation. For Sherry, “it was important to have different co-op experiences to help guide my decisions [post-grad] and give me more experience.” For others, they may return to the same position for more than one term, or be offered a post-grad job before they even graduate, as was the case for Matt, BTM ’15. To help prepare current BTM students for their first co-op interviews, advisory council members shared both their personal experiences and top tips for prospective employees. Here is a compilation of their top 10 tips. Take every interview you get, regardless of whether or not you want the job. Think of it as a learning opportunity. Remember that interviews work two ways – it’s not just a judgement about you, but about finding the right fit. As a new grad, you’re not going to have all the knowledge that comes with experience. Figure out what you’re really good at and use that as your way in. Connect and engage with people. It’s not always about the tech. Fit with the culture, values, and community are key. Do your homework. Prepare yourself before the interview – go to the website, have questions to ask. Bring examples from school, co-op terms, and even your personal interests that highlight your skills. Present yourself with professionalism. Communication and personality will help you stand out. Your skills on paper got you in the door. Remember: The people interviewing you will be people you work with. Be humble in the beginning. Ask questions and look for answers, but don’t assume no one has ever thought about your idea before. When recommending efficiencies or changes within an organization, make sure they can be maintained regardless of your place within the company. If it requires you to keep it running, it’s likely not the right solution (especially true of co-op positions). Curiosity is a key attribute in tech. If you’re bored, look for what you want and ask for it. If you’re feeling overwhelmed, you need to articulate it with your manager. Be open. Managers aren’t mind readers. Scott Lyons, President, Extend Communications Inc.
Musharaf Mughal, Director & Chief Architect, Scimitar Solutions, Inc.
Alistair Todd, Director of HR, Apotex Pharmachem Inc.